Some worrisome stats for your morning: new research concludes that excess salt consumption has had a hand in over two million heart-related deaths worldwide in 2010, 40% of which were premature. 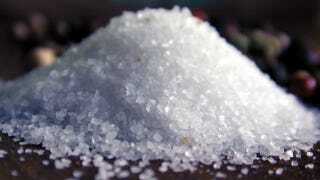 [Study participants] reported on their sodium intake from 1990 to 2010 in food questionnaires. Overall, adults around the world ate an average of 4,000 mg of sodium a day, either from prepared foods or from table salt, soy sauce or additional salt sprinkled into meals while cooking. That’s twice the amount recommended by the World Health Organization (2,000 mg per day) and nearly three times the amount the AHA says is healthy (1,500 mg per day). Among the 30 largest countries, the highest death rates due to excess salt consumption per million adults were Ukraine (2,109); Russian (1,803); and Egypt (836). The United States ranked 19th out of the 30 largest countries, with 429 salt-related deaths per million adults (which translates to 1 in 10 heart-related deaths in the U.S., according to the study authors). Among all countries surveyed (187 in total), those with the lowest salt-related death rates per million adults were Qatar (73); Kenya (78); and United Arab Emirates (134). Kenya was reportedly the only country surveyed to adhere to the AHA's recommended 1,500 mg/day limit. The highest proportion of cardiovascular disease related deaths tied to salt-laden diets were in the Philippines, Myanman and China. We're really love to see a comparison between this study's results and those of this investigation on fast-food salt content by country. Good money says you'd see some interesting overlap. Tons more coverage on these studies around the internet today, including over at Time, Bloomberg and US News, but the most lucid and comprehensive that we've happened upon thus far comes from Medpage Today – we recommend heading there fore more details.